WASHINGTON – The embattled president of the nation’s oldest Latino civil rights organization refused to resign on Friday, prompting the group's CEO who has served with the organization for 30 years to quit. Roger Rocha Jr., president of the League of United Latin American Citizens, told NBC News he will finish his term, which ends at LULAC's July convention. 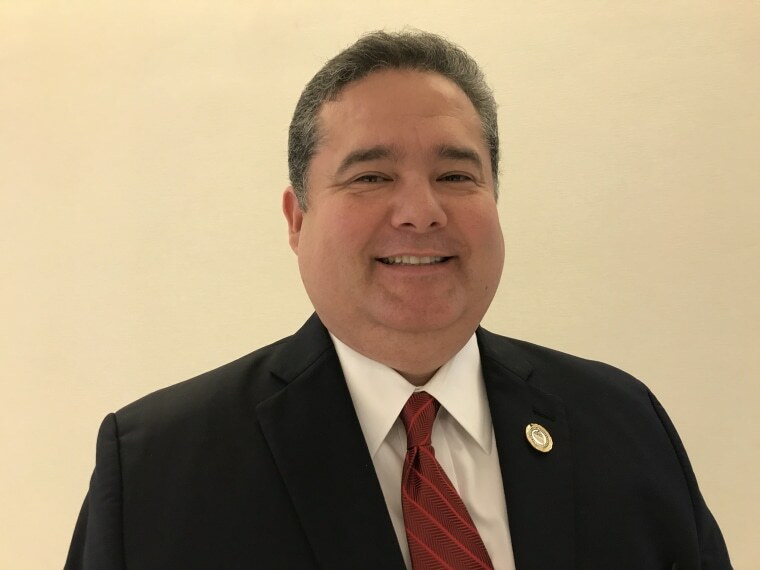 "I was elected to the office of the national president and that term ends at a convention, so that is when my term will end," Rocha said, after delivering the news to organization officials. To keep the board from impeaching him, which some members had wanted, Rocha filed a lawsuit against LULAC and its board and executive committee and obtained a temporary restraining order from a Texas court. Rolando Gonzales also was a plaintiff in the lawsuit. The board was to meet again Saturday. Brent Wilkes, LULAC's former CEO who is credited with elevating the group, expanding its agenda and attracting younger members, resigned immediately. He emerged from a closed door session of LULAC's board and members teary-eyed, as did members of his staff. "They (board members) probably know in their heart that this was an unforced error that we didn't have to put the organization through," Wilkes said of the board. He said he still plans to volunteer because he loves the organization and its impact on people's lives. "The last day should not be the story here, the story is really the 30 years before that and all the stuff we've been able to accomplish and I'm proud of that," Wilkes said in a tearful interview. Rocha, elected in July 2015, said he chose not to resign because "there's still a lot of work that we have to do." "We have 1.8 million lives called Dreamers that we have to impact and effect," he said. By refusing to step aside, Rocha set off a battle within the organization that has existed since 1929. "I just can't believe that he is not seeing the consequences of his actions," said Abigail Zapote, national vice president for LULAC's young adults members, about Rocha. Young adult and collegiate members of LULAC, as well as state directors of LULAC from throughout the country, including his home state, have demanded Roger's resignation and wrote letters to the LULAC board expressing their outrage. Some used the group's impeachment process to try to force him out. Members demanded Rocha step down after he sent a Jan. 28 letter to President Donald Trump saying LULAC could support Trump's immigration demands — billions for a border wall, slashes to legal immigration, an end to the diversity visa lottery and more enforcement and border security. The backlash on Twitter was so intense that LULAC was forced to restate its positions on immigration and the border wall and Wilkes issued his own personal statement criticizing Rocha's letter. The letter came in the midst of intense political wrangling over immigration and Trump's immigration "framework" and as the clock has been ticking on the Deferred Action for Childhood Arrivals, or DACA, program. Trump set a March 5 date for the program to end, but two courts have blocked the administration from halting renewals of DACA while lawsuits against the administration go forward. The Senate failed to pass legislation Friday night based on Trump's immigration's proposals. Rocha had called the letter the "worst mistake of my life," but said Friday that in LULAC "administrations change or continue at conventions. That's how we do things." He said he would not run for re-election. Rick Dovalina, a LULAC past president, said he was glad that Rocha wasn't stepping down. "I think we'll survive whatever turmoil there is. We've survived before and we're going to move forward. We have a convention four months. If they don't like the president they can vote him out. It's a process." LULAC's national convention is scheduled to be held July 17-21 in Phoenix. Also, finances were discussed and those in the meeting were given what one member said was a "dark" picture of where the group stands financially.